The Communist Cinderella Alexandria Ocasio-Cortez found her prince, George Soros, and that is who helped her defeat Rep. Joe Crowley in NY 14. As far-left as Crowley is, and he is, he wasn’t far-left enough or young enough or pretty enough for Soros. They want to put lipstick on the Communist pig. Soros’s people always go for the most Progressive [Communist/Socialist] candidates. Ocasio-Cortez was a Bernie Sanders organizer. She was also backed by the powerful George Soros-funded Media Consortium. In a June 27 interview with Uygur on his YouTube channel “The Young Turks,” Ocasio-Cortez thanked Uygur and other Soros media platforms for covering her before the primaries, which she says “in no small part” helped her win [see video below]. The Young Turks is a member of The Media Consortium — a network of far left media publications which includes Mother Jones, Democracy Now!, and dozens of other outlets, funded by Soros. The Young Turks also founded in part Justice Democrats and Brand New Congress. That ties Cindercommie to Soros Media and the former Young Turks star, sexist, racist pig Cenk Uygur. Uyger helped found Brand New Democrats and Justice Democrats. Ocasio-Cortez’s website address once belonged to Brand New Congress. Their goal was to have 400 candidates run for Congress by last year. Each of those 400 is supposed to commit to a similar far left platform. That includes immigration reform, Communist healthcare, free everything, and the abolishment of ICE. They seem to have far fewer than that, with only 29 including Ocasio-Cortez listed on their website.The other candidates you see Ocasio-Cortez campaigning for include Cori Bush and Brent Welder. They are also part of this group of new young commies in the media network. The Brand New Congress/Justice Democrats also push far-far-left Cynthia Nixon who is running for governor of New York. At the ten-minute mark, O-Cortez notes that BNC and the JDs were instrumental in soliciting her and then promoting her “after she left Standing Rock” which means she was among the far-far-left pipeline protesters. Video via WeaselZippers.us and Internet sleuth Rich Weinstein who tied her to Soros on Monday. The Young Turks founder and host Cenk Uygur and co-founder David Koller have been forced to resign from Justice Democrats after their racist and sexist blog posts were uncovered. He has since apologized and said he doesn’t mean it now though his comments on his show could prove otherwise. The far-left Progressive Uygur claims he wrote them as a conservative but he has degraded women on his Progressive show. The old Uygur is still there and conservatives don’t approve of his sexist and racist views. Might she be a Loose-Cannon, "A Trump on the Left"? Is Alexandria Ocasio-Cortez Too Far Left for (Rich) Hollywood? The newly minted Democratic star makes her first appearance in Los Angeles on Thursday — but she isn't meeting with traditional Hollywood power brokers for now. With rock-star Democratic congressional candidate Alexandria Ocasio-Cortez set to make her Los Angeles debut on Thursday, the 28-year-old's two-day trip will be marked as much by the throngs of people she'll meet as by the handful of notables that she won't. In a break with tradition, Ocasio-Cortez, who labels herself a democratic socialist, has no plans to meet with any of the entertainment industry's Democratic political power brokers while she is in town. She will not be having coffee with Carl Reiner. There will be no sitdown with Jeffrey Katzenberg or David Geffen. No $5,000-a-plate dinner at Robert Iger's mansion in Brentwood. "None of our clients are meeting with her," says Marie Lloyd of the political and philanthropic consultancy Gonring, Spahn & Associates, which counts Katzenberg and Steven Spielberg as clients. And none of the other political operatives or members of the industry's donor class reached by phone were aware of any meetings scheduled with Ocasio-Cortez. Some weren't even aware she was coming to town. But it's not just the donors. Even though Mayor Eric Garcetti is currently in Asia, a source within City Hall tells The Hollywood Reporter that Ocasio-Cortez's team did not make any outreach to his office regarding her trip. Typically, high-profile Democrats make the rounds in Hollywood for fundraising meet-and-greets even if their jurisdiction is far from Los Angeles. Instead, the Bronx native and member of the Democratic Socialists of America, who gained overnight fame after defeating 10-time incumbent Rep. Joseph Crowley (D-N.Y.) in the district's primary last month, will be holding a sold-out luncheon Thursday in downtown L.A., where tickets are going for $27. That event is in partnership with Occupy ICE L.A., an organization that stages demonstrations to disrupt operations at U.S. Immigration and Customs Enforcement (ICE) locations — in protest against the Trump administration's "zero tolerance" immigration policy. Ocasio-Cortez's event is scheduled for 11 a.m.-2 p.m. at the Los Angeles Theatre Center on Spring Street.
. . . On Friday, the Democratic Socialists of America L.A. chapter will host a sold-out "Evening With Alexandria Ocasio-Cortez" from 7-9 p.m.at the First Unitarian Church that will include a conversation about "taking on the political establishment" and how best to create "a better, socialist future." The church's capacity is 700 and prices for tickets range from $50 for "core supporters," to $27 for "supporters" and $15 for "friends." Is he to the Left of the usual Dem power brokers? WHO IS GOING to wind up paying for all the Free stuff these politicians will demand ... if they win? Despite claiming on its website to have 250+ campus chapters, the Young Democratic Socialists of America organization actually has just 57 active chapters, a spokesman acknowledged. The Hillary Clinton-Bernie Sanders divide within the Democratic Party lives on. Failed 2016 Democratic presidential nominee Hillary Clinton weighed in on the Michigan primary one day before voters go to the polls, but she did not endorse the same candidate as did the party’s newest darling, Alexandria Ocasio-Cortez. Clinton endorsed former Obama administration official Haley Stevens in a crowded primary race in Michigan’s 11th Congressional District, the support coming after the self-avowed democratic socialist Ocasio-Cortez endorsed candidate Fayrouz Saad. Saad, a former Department of Homeland Security official, would be the first Muslim women to be elected in the House, which must carry more political weight with the radical left than a former Obama staffer. Democrats see this seat as being key to retaking the majority in the House. President Donald Trump narrowly carried the suburban Detroit district in 2016 and incumbent Republican, Rep. Dave Trott, is retiring. Ocasio-Cortez, the Democratic congressional nominee from New York, is traveling around the country endorsing candidates — before being officially elected herself — all because of the rock star reception she received by openly embracing socialism. While there may be a valid argument over whether socialism is an established pillar of the party, many Democrats remain hesitant about publicly acknowledging this. Six weeks after Ocasio-Cortez stunned Rep. Joseph Crowley (D-N.Y.), signs of a tea-party-like movement in the Democratic Party that would throw winnable races to far-left candidates appear to be fading. Instead, the party’s establishment has embraced ideas like expanding the Affordable Care Act, shrinking the space between its leaders and its disrupters. The party’s centrists, who had bemoaned Crowley’s defeat, saw Tuesday night as a turning point. Whitmer, who ran on her record of expanding Medicaid in Michigan — and a memorable promise to “fix the damn roads” — will now lead an all-female ticket in a swing state that Hillary Clinton narrowly lost. Ben Shapiro is done with the dim-witted shenanigans of commie weirdo Alexandria Ocasio-Cortez, and Ben Shapiro is going to do something about it, by gum!!! While Venezuela continues to collapse into a living hell for all but Nicolás Maduro and ruling elites, support in America for democratic socialism continues to rise.
. . . These may be some of the explanations for increasing support for democratic socialism; and yet, there is another factor at work. Americans are increasingly allowing their thinking to be influenced by logical fallacies. Charlie Munger is vice chairman of Berkshire Hathaway, the legendary conglomerate he controls with Warren Buffett. In a speech at Harvard University about human misjudgment, Munger tells of a surgeon who removed “bushel baskets full of normal gallbladders” and continued maiming patients for five years past the point he should have been removed. For the surgeon’s patients, his good intentions were of little comfort. When doctors of the ailing George Washington bled him, they were motivated by good intentions; and their unscientific medical practice arguably hastened Washington’s death. Politicians who trust their seat-of-the-pants good intentions inevitably become authoritarians. They are relying on the limits of their error-prone minds and not on proven principles that promote human flourishing. Although we have not agreed with all of the methods followed by his government, we have never doubted Hugo Chavez's commitment to improving the lives of millions of his fellow countrymen. It is the internal threat coming from men of good intentions and good will who wish to reform us. Impatient with the slowness of persuasion and example to achieve the great social changes they envision, they are anxious to use the power of the state to achieve their ends and confident of their own ability to do so. Yet if they gained the power, they would fail to achieve their immediate aims and, in addition, would produce a collective state from which they would recoil in horror and of which they would be among the first victims. That "concentrated power is not rendered harmless by the good intentions of those who create it” has become among Friedman’s most famous ideas. His warning is ignored today by those believing the “good intentions” of politicians, such as Bernie Sanders or congressional candidate Alexandria Ocasio-Cortez, will render their destructive policies harmless. Let us grant “good intentions” to today’s cadres of democratic socialists. Let us assume they are “thinking positively.” No matter. No good intentions or positive thoughts will overcome how reality works. The destructive outcomes of socialism will follow as history repeats itself. HAS SHE THE COURAGE to do a Real Debate? The congressional candidate got into a heated exchange with the legendary counting expert, fumbling her words as he calmly tallied up the trillions of dollars she hadn’t accounted for in her proposals. “Like, we like, pay for other things and just like, invent money and stuff to pay for national security and stuff, so why can’t we invent trillions for making jobs and healthcare and education?” she responded, but the Count was ready with a helpful chart that pointed out that the existing programs she referred to didn’t total anywhere near the cost of her proposals. “ONE failed politico-economic worldview—Ah! Ah! 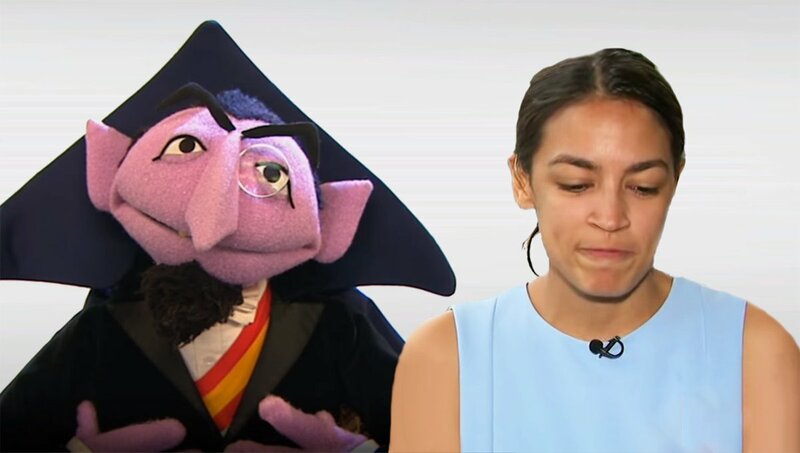 Ah!” the Count said, dealing a fatal blow as Ocasio-Cortez stormed off the set. At publishing time, she had tweeted that the Count’s offer to debate was akin to “catcalling” and that Sesame Street producers should have labeled the segment as satirical. She seems to only be comfortable with: "Soft-ball questions... People skating around issues"
The prom queen of socialism says debates are sexist. Everyone’s favorite Democratic socialite continues to entertain, and not merely because of her unique views about how the world works beyond Westchester, NY. She has kept us in stitches with her claim that Medicare-for-All will save the nation zillions in funeral expenses, her weird belief that questions about the costs of M4A are merely GOP talking points, and her unique theory about the SCOTUS ruling in NFIB v. Sebelius. Now she has us slapping our thighs with comical excuses for refusing to participate in a debate about the virtues of socialism versus those of capitalism with black conservative Candace Owens. Shortly following her refusal to accept a debate challenge from Ben Shapiro, claiming that it was somehow sexist, Candace Owens called out Ocasio-Cortez on that excuse by offering to donate $20,000 to a charity of the latter’s choice if she would debate capitalism vs. socialism. The self-styled “girl from the Bronx” has declined, but Owens isn’t letting her off the hook: “And what exactly was your excuse for having turned down the debate with me? Can’t wrap that one up in fake-feminism.” Not that her excuse is really a secret. Ocasio-Cortez knows little of socialism’s intellectual foundation, such as it was, and less about capitalism. Gone are the days when serious, if hopelessly misguided, people like Michael Harrington could debate socialism in a civil fashion with heavyweight conservatives like William F. Buckley. All of Harrington’s claims have now been shown by history to be false, leaving the left with a catalogue of empty slogans parroted by “progressives” who couldn’t stay in the ring with Buckley for 30 seconds. This is why the American left has now reverted to the suppression of free speech, the verbal abuse of its opponents, and outright violence. History hasn’t been kind to socialism, and honest debate will not be kind to Ocasio-Cortez. On Monday, New York Democrat congressional candidate Alexandria Ocasio-Cortez bemoaned the “hate, subconscious bias, and criticism” from her opponents after she made absolutely absurd and non-factual statements. Even The Washington Post fact-checked her most embarassing statements although they only chose five. She really has little knowledge of politics and economics and she is heading for Congress. She should probably take that as constructive criticism. 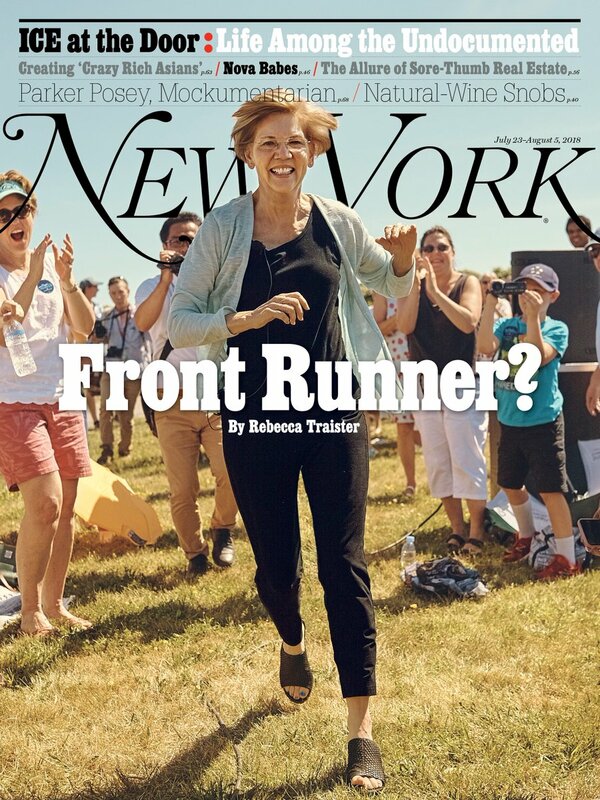 Her endorsements are the kiss of death but she continues to attend town halls with Democrat leftist candidates anyway, and in one case, forgot the introduce the candidate. Last Thursday, she attacked Daily Wire Editor-in-Chief Ben Shapiro of being sexist and “catcalling” her when he offered to donate $10,000 to her campaign or a charity if she debated him. The real issue is she has to avoid debating at all costs because of her profound lack of knowledge. O-Cortez has argued that her “Medicare for All” idea — which studies show will cost $218 trillion over 30 years — would lower the cost of funerals. She also claimed in the same interview with CNN that America does not have an “upper middle class,” a statement that even liberal networks have noted is not true. Could Alexandria Ocasio-Cortez Lose The Election? New details have emerged showing the ties between Communist Alexandria Ocasio-Cortez and wealthy elitist, George Soros. Soros’ media network helped ensure that the socialist would win the primary election. According to The Daily Caller, in an attempt to put 400 Bernie Sanders-like politicians in Congress, George Soros has propped up the political career of now infamous communist, Alexandria Ocasio-Cortez. Ocasio-Cortez was formerly a Bernie Sanders presidential campaign organizer. The New York Times wrote that the communist was able to defeat her opponent, who greatly outspent her, due to her online presence. In an interview with a “progressive” and communist-leaning digital media outlet The Young Turks, which is a member of a Soros-funded network of far-left publications called The Media Consortium, Ocasio-Cortez also admits that their coverage helped her achieve her win. Cuban dictator Raul Castro's alternately affable and defiant denial of human rights violations at his brief "press conference" with President Obama in Havana reminded me of a similar performance by his brother here in the U.S.—probably the only other time a Castro has submitted to even cursory questioning from foreigners.